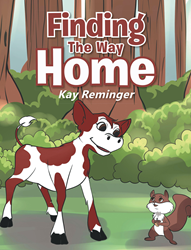 Based on a true story, “Finding the Way Home” from Christian Faith Publishing author Kay Reminger is a delightful children’s book featuring young Strawberry, an auburn-colored calf, who one day accidentally gets too far from her farm and wanders deep into the forest, where she realizes she must rely on God and her newfound forest friends to help her survive and eventually find her way back home to Farmer, his daughter, and her mama. “Finding the Way Home”: a beautiful story of a young calf who goes too far from the farm. “Finding the Way Home” is the creation of published author Kay Reminger, a weekly newspaper columnist and farmer’s wife who has spent her whole life tending to God’s creatures when she isn’t reading great books or raising Black Angus cattle with her husband down in rural Northeastern Wisconsin. Reminger shares Strawberry’s special life story: “‘When you were first born, a brand new little auburn-colored calf, your mother decided right then to call you her Strawberry. She and I were such good friends. We both loved you from the moment you were born, even though you looked different than any of the other black-and-white cows or heifers or calves in the barn. Your mother and I and Farmer, the one who tends to us, all know that God loves us the same. Even though sometimes our choices can land us into a pickle, we know that if we get into any sort of trouble, and if we’re ever lost or alone and need His help, all we have to do is ask, and somehow He will provide. Published by Christian Faith Publishing, Kay Reminger’s new book is a heartwarming reminder for children to trust in God and His timing whenever they find themselves lost, afraid, and alone, remembering that they are special and loved. Strawberry’s story will also encourage young readers to accept their God-given uniqueness, even if it makes them stand out from others. View a synopsis of “Finding the Way Home” on YouTube. Consumers can purchase “Finding the Way Home” at traditional brick & mortar bookstores, or online at Amazon.com, Apple iTunes store, or Barnes and Noble. For additional information or inquiries about “Finding the Way Home”, contact the Christian Faith Publishing media department at 866-554-0919.